Ask 10 teachers how to find the main idea and you’ll get 15 good (but different) answers. The process of identifying the main idea appears to be a slippery concept and students get lots of different answers about how to go about it. The problem may not be that these answers are ‘wrong’, just that they differ from class to class (or even within a class). There is a need for a consistent, workable process to avoid confusion and poor results in both reading and writing. The key to effective studying (or writing) is to be able to identify the essential points about a topic. How many times have you seen a student highlight in yellow virtually an entire page (or highlight nothing at all)? This inability to identify the key elements of a passage leads to a “shotgun” approach to studying, focused on nothing in particular. When attempting to learn information, the student is either forced to re-read entire texts or, in frustration, refuse to study at all. 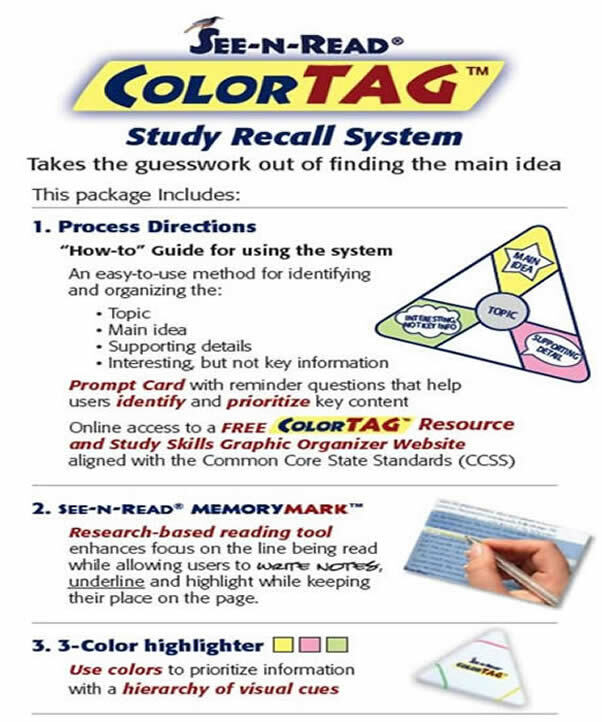 is a study tool kit that provides a practical color-based approach to identifying the main idea and supporting details as distinct from interesting (but not essential) information when reading or writing.